By the summer of 2009, Verneuk Pan in the Northern Cape region of South Africa was becoming our firm favorite for running BLOODHOUND SSC, despite the mountains of stones. It was the site of Malcolm Campbell’s 1929 record attempt track. Campbell was also worried by the stones and shale and a large team of labourers took 3 months to prepare a track 120 ft wide for him. We need to prepare an area 18 km long by 1500 m wide, about 40 times the size of Campbell’s! What would have made Verneuk possible though, was the support of the Northern Cape Government. They saw that the huge global PR, the national excitement, and the close links with the BLOODHOUND education programme would all benefit South Africa enormously. The Northern Cape Government commissioned a full survey of Verneuk Pan, to confirm the work required. However, it was not good news: clearing Verneuk was going to be much more difficult than we expected. A full survey last month revealed that the shale bed was breaking up underneath the playa surface and would cause us a lot of problems. The end of the road for South Africa? Not quite. There was one other option – Hakskeen Pan. Hakskeen Pan, right in the North Western corner of South Africa, was initially dismissed because of a large dirt road running across it. However, last year a new tarmac road was built across the end of the Pan and the old dirt road became defunct. Could we move the dirt road causeway and repair the surface? Previous test repairs on Verneuk Pan suggested that we could. A final desert visit was called for – and in early November Andy Green and John Piper made another journey to Northern Cape Province. This time, the news was all good. Over 19 km long, 5 km wide, very hard and very flat (apart from some surface stones – and the dirt causeway, of course! ), great access (the new tarmac road), nearby accommodation, on-site power, good communications, ideal weather: this was the location Andy Green had been chasing for over a year and a half! So that’s it. The desert search is over. BLOODHOUND SSC will run at Hakskeen Pan in South Africa – and at last we have a desert that we can call ‘home’ to the world’s first 1000 mph Car. But where exactly is Hakseen Pan? Have a look at the map below. Using the zoom out button (the one marked "-" in the top left hand corner), you will see that it is right in the North West of South Africa, not far from Namibia. The effect of 5 tonnes of loading! A 150km pipeline will bring water to villages and cattle ranches to Hakskeen Pan border. The Bloodhound project has been working for the past three years at Hakskeen Pan and in the surrounding communities because this is where the team will be testing a supersonic car in 2015 and 2016, chasing a new land speed record over 1600km/h. "This is a video I made of a run from North to South on the Eastern Side of the Track. The markers you will see passing on the left are the kilometer markers. This story is a translation of an article that was originally published in South Africa on 28 July 2013 in the weekly magazine “My Tyd” (Eng: My Time), a supplement to the Afrikaans language Sunday Newspaper “Rapport”. The original text is by Johan Bakkes, translated to English by Juanita du Toit and edited by Jackie Viljoen. We thank Rapport for the permission to translate and publish this article online. 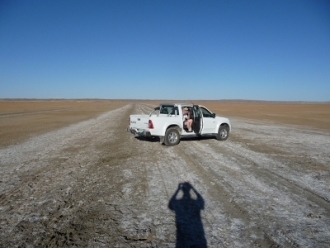 Hakskeenpan flooded - good news! Hakskeenpan played host recently to the first Kalahari Speedweek in South Africa when hundreds of car and motorbike fans unleashed their vehicles on the surface of the pan in the far north west of the Northern Cape. Speed was the name of the game for the multitude of very different young and old entries ahead of BLOODHOUND SSC’s arrival in 2013 and was a great trial run to show what the team must expect. This is a difficult update to write because I can’t really describe in words the scale of what is happening in South Africa. I’ve just got back from a technical survey of the desert work (and some media interviews, to explain how we are getting on) and I’m still amazed by what I’ve seen. I was with a couple of experienced journalists, who were fairly quiet over dinner after their visit to the Pan, as they tried to grasp the enormity of what they’d just seen.